Justin Rice graduated from Harvard with a degree in comparative literature. 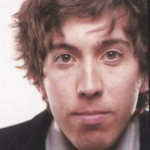 He is a software developer specializing in Python programming and is a writer for LitCharts. On January 20th, Donald Trump delivered the 58th presidential inaugural address. Trump is a singular figure in US history, and it doesn’t take Cassandra to predict that hordes of pundits will spend countless hours dissecting the content of his speech. Rather than analyzing what Trump says, we’re using data analysis to explore how he says it, and comparing his words with those of the 57 previous inaugurals to see what we learn. We’ll start with a quick and dirty comparison to identify broad trends, while also establishing some of the concepts we’ll use to compare Trump’s speech to the other inaugural addresses. Mr. Trump’s speech had the shortest sentences of any inaugural to date. 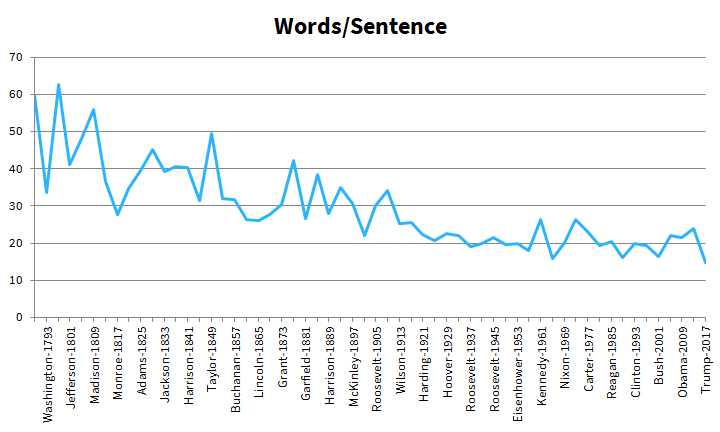 That tracks with the fact that 1447 words is fewer than average, but 98 sentences is slightly more. 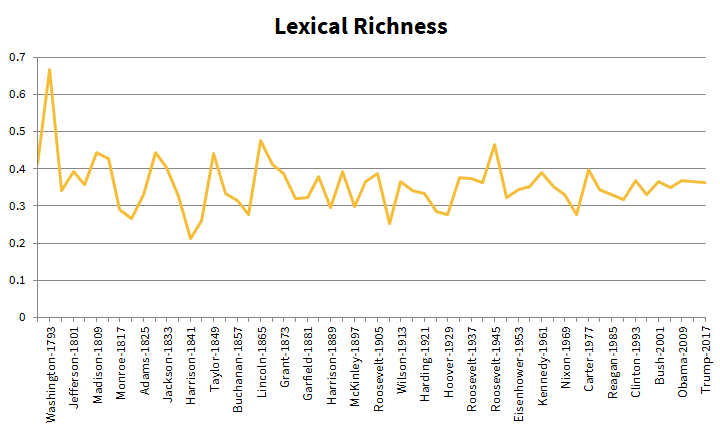 The lexical richness of the speech (the proportion of unique words to total words) falls right in the middle, but the speech’s 8th-grade reading level (which results in part from its shorter sentences) is extremely low. 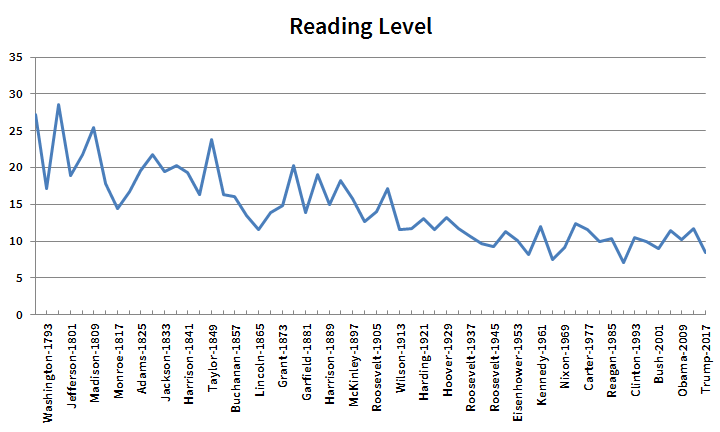 Only Dwight Eisenhower (1957), Lyndon Johnson (1965), and George Bush (1989) scored lower reading levels. Together, these numbers indicate that Mr. Trump’s speech was less complex than previous speeches. And while that observation isn’t exactly shocking—Mr. Trump is, after all, famous for making news with 140 characters—it does lay the foundation for the further analyses below, which reveal a lot about inaugurals in general and Trump’s in particular. And to really understand Trump’s speech in context, we need to understand how inaugurals have changed over time. The reading level of many of the early inaugurals is astonishingly high, peaking with John Adams’s speech, which has a 29th-grade reading level. Theoretically, it requires 17 years of college and graduate school to be able to comprehend that speech. Divided, there is little we can do—for we dare not meet a powerful challenge at odds and split asunder . The early inaugurals are like Adams’s: dense and knotty, difficult even on paper. From Coolidge on, the inaugurals are more like Kennedy’s. That change coincides with an increase in the popularity and reach of the speeches themselves. Washington began his first inaugural, “Fellow-Citizens of the Senate and of the House of Representatives.” Coolidge began his with, “My Countrymen.” Washington was speaking to a rarified group of professional politicians on a Wall Street balcony. Coolidge was speaking to the entire country: his was the first address broadcast over the radio. From Coolidge on, every inaugural has been heard not by dozens, but by millions. There is no constitutional or legal requirement that the President shall take the oath of office in the presence of the people, but there is so manifest an appropriateness in the public induction to office of the chief executive officer of the nation that from the beginning of the Government the people, to whose service the official oath consecrates the officer, have been called to witness the solemn ceremonial. The oath taken in the presence of the people becomes a mutual covenant. As you may be able to tell from the sentence above, Harrison’s speech is only about halfway down the decreasing trend in complexity. It predated radio, but it was disseminated widely in newspapers. Later, less complex speeches were written for the common man to listen to. Harrison’s was written for the common man to read. It was dramatic (and combative) and favored a strong storyline over specific plans or policy details. In a departure from his earlier speeches—many of which we analyzed in preparation for this Analitic—Mr. 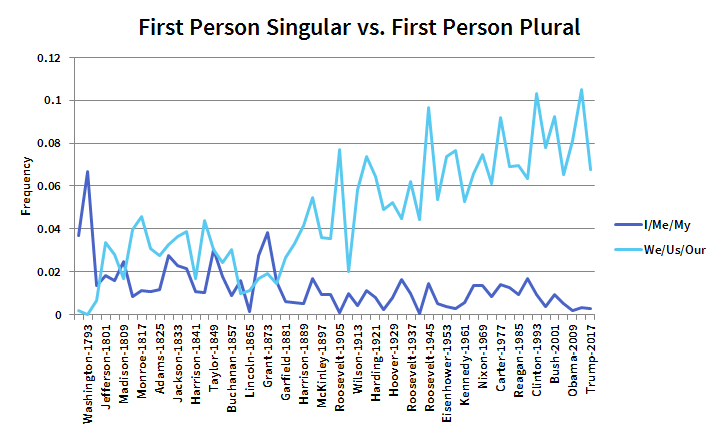 Trump continued the trend of choosing first person plural over first person singular. Combined, he used “I,” “me” and “my” a total of 4 times. “We,” “us,” and “our” were the pronouns of choice: combined, he used them 98 times. For the first time Mr. Trump seemed to be trying to speak for the whole of America. Modern inaugurals are less complex than early inaugurals, but not at the cost of lexical richness. Presidents aren’t exactly dumbing things down for us–they don’t assume we have limited vocabularies–but they are trying to speak our language. So they tend to use words that fit the current vernacular. To Americans, “shall” began to sound outmoded (or perhaps British) somewhere around World War II, and presidents pretty much stopped using it. 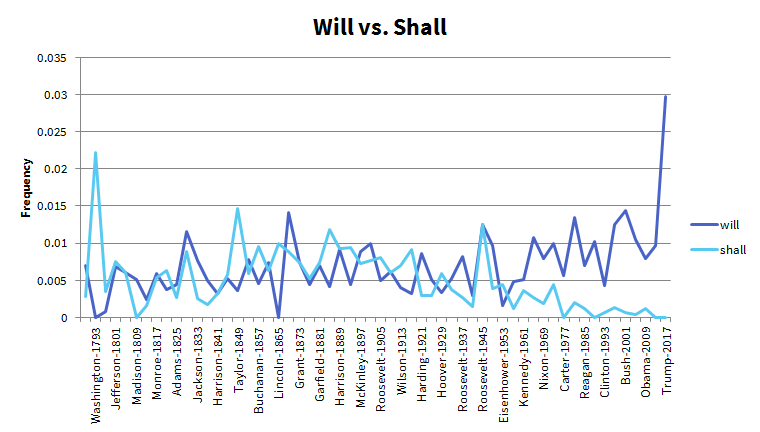 “Will” has the same imperative force, but doesn’t clang as much to modern ears. Increasingly, presidents talk about “America”—a particular nation, taken as a whole—and “Americans”—individuals defined by their relationship to that nation. 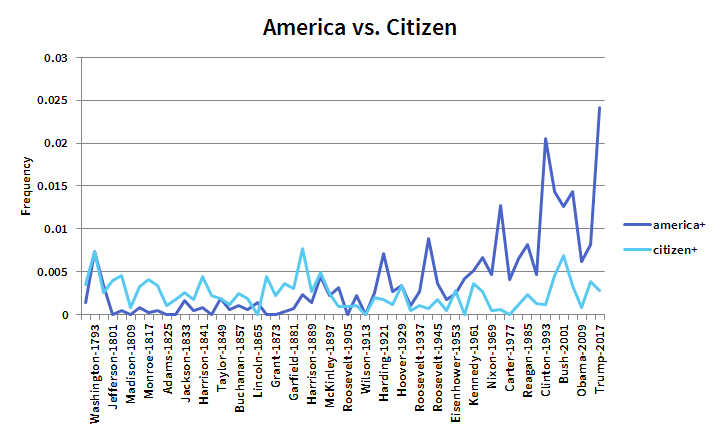 They favor those words over the more generic “citizens.” It’s interesting that this shift first took hold after 1910, when the country emerged as a world power during and after World War I. Presidents, in other words, began to talk about “America” and “Americans” as the United States shifted from establishing (and warring against) itself to measuring and defining itself against the world. He outlined a series of steps we have yet to take to (five sentences began, “Our journey is not complete…”), one of which was the realization of gender equality (“…she is an American, she is free, and she is equal…”). He promised to “bring back our dreams,” to “bring back our borders,” and to “shine for everyone to follow.” Where Mr. Bush told a story about defending freedom and Mr. Obama told a story about a shared journey to equality, Mr. Trump told a story about lost innocence and a return to some kind of purer Edenic time. His speech wasn’t about moving forward: it was about turning back the clock. Got feedback or an idea for a future Analitics article? Contact us. Author Justin RicePosted on January 3, 2018 January 19, 2018 1 Comment on Does Trump Really Have the Best Words?